Roku, Inc. (the �??Company�?? or �??Roku�?? ), was formed in October 2002 as Roku LLC under the laws of the State of Delaware. On February 1, 2008, Roku LLC was converted into Roku, Inc., a Delaware corporation. The Company�? ?s TV streaming platform allows users to easily discover and access a wide variety of movies and TV episodes, as well as live sports, music, news and more. The Company operates in two reportable segments and generates revenue through the sale of streaming players, advertising, subscription and transaction revenue sharing, as well as through licensing arrangements with TV brands and cable, satellite, and telecommunication service operators (�? ?service operators�??). The bullish thesis for Roku follows a thread of thought like this. The linear TV advertising market, globally, is at over $200 billion. Here is the chart from Statista. 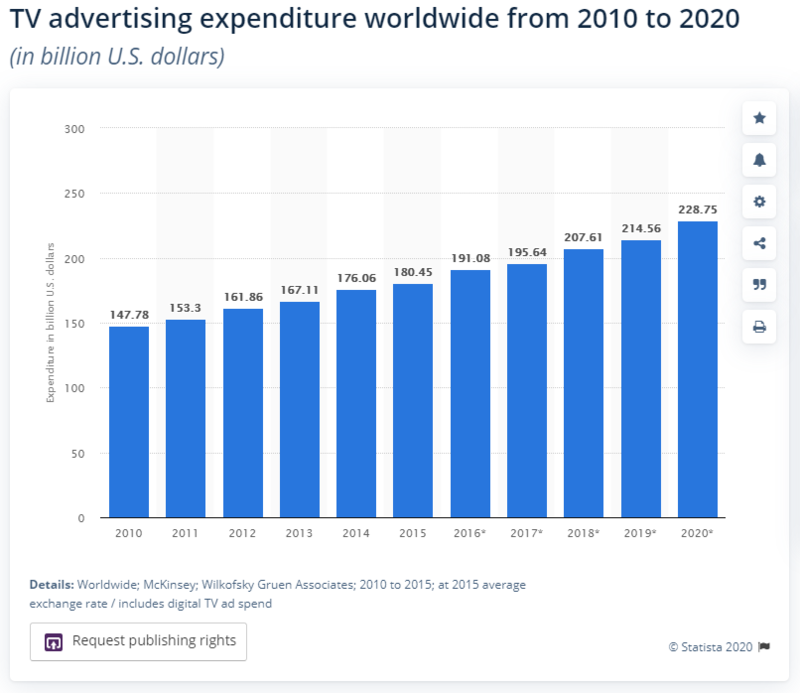 TV advertising expenditure worldwide is expected to grow to $228.8 billion. The portion of that in the United States is forecast at about $75 billion. Now, all the TV advertisers see what directed and personal ads can do -- they are buyers on Facebook as well, but they were hamstrung -- if you want to reach TV viewers, you have to go rather blindly. Then cord cutting and streaming happened. eMarketer projected that the number would increase from 24.9 million in 2017 to 55.1 million in 2022. The cord cutters who are now OTT subscribers, are still consuming TV -- in fact, their appetite is voracious with all the new content coming from... everywhere. With the number of hours of TV getting turned into streaming, and with the digital footprint that ROKU takes up with its tens of millions of active users, this company has turned TV ads into Facebook. Roku is a pioneer in advanced OTT advertising with the industry's first Nielsen measurement solution, native interactive ad technology, and its recently launched Roku Ad Insights Measurement suite. Roku operates a large and growing dedicated OTT ad sales team. With the launch of Audience Marketplace, Roku is extending these advanced targeting capabilities to major publishers, as part of an effort to enhance advertising flowing through its platform, and to help publishers make their offering more compelling in an increasingly programmatic, data-driven TV advertising market. Every advertisement on ROKU to its users is custom for that individual user. Further, according to Nielsen, 10% of 18 to 34-year-olds in the U.S. are only reachable on the Roku platform in the living room. "A recent study by IPG and MAGNA concluded that ads on the Roku platform are 67% more effective per exposure at driving purchase intent compared to traditional linear TV ads." Roku believes that the story may not even be in those lines above. Roku announced its own channel - where it controls everything (as opposed to streaming hours on Netflix on ROKU). This channel is now available on the web, even mobile, without owning a Roku streaming stick or a smart TV powered by Roku. Then it went further, On January 2nd, 2019, Roku announced it is expanding The Roku Channel to include "Premium Subscriptions." In addition to 10,000+ free ad-supported movies and TV episodes already available, The Roku Channel will soon offer users the option to add 25+ Premium Subscriptions from providers such as SHOWTIME®, Starz and EPIX. Beyond streaming sticks and boxes, Roku is also licensed by actual smart TV makers -- that's the glass and metal crew, Element, Hisense, Hitachi, RCA, Sharp, Westinghouse, and TCL (the second best selling smart TV maker in the United States). You see, Roku's business goes beyond "those sticks you use for streaming that time," and well into the guts of technology - the guts of a new thematic, whether that be a streaming stick, a streaming box, or the actual operating system for smart TVs. Whether the company is successful or not is certainly up for debate -- large competitors could be its downfall. But, the bullish thesis rests in the lines above.